Ron was born in Boston and was educated in and around the city. He graduated from Vesper George School of Art in Boston in the late 60's. Ron spent his earlier years painting on the seacoast of New Hampshire while operating a fashionable picture frame business for the last forty years in the town of Rye New Hampshire. 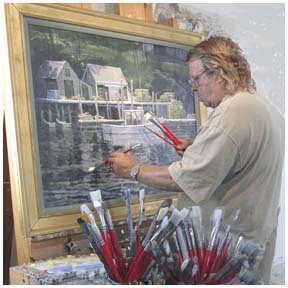 Now being retired from his frame business, Custom Frame and Color, Ron spends all of his time in New Harbor painting and running his gallery. His inspiration comes from the working harbors, lighthouses, island coves, and craggy coastlines all within minutes of Fletcher Gallery. Painting professionally for over forty years, his work is hanging in numerous corporate collections as well as private collections through out the United States and abroad.